Zymo Research's core beliefs are based on innovation, quality, and customer service. These three paradigms are ingrained in their company culture. They believe their products are the most reliable and uphold to the highest standards of quality in the industry as evidenced by their ISO 9001 certification. They have also received Frost & Sullivan's Best Practices Award for Leadership in Epigenetics Product Quality. To provide the most reliable, innovative, and valuable biomedical tools and services to our customers through research and strategic development. To have a positive impact in the biomedical field and to contribute to the greater good of humanity.
" Treat others as you would like to be treated " . We strongly believe this principle dictates teamwork and open communication. Larry Jia, M.D., founded Zymo Research Corporation in 1994. With humble beginnings, he started manufacturing the first DNA/RNA extraction and purification products for E. coli and yeast out of a garage in Orange, California. Today, Zymo Research is a multi-million dollar company with its headquarters based in Irvine, California. In addition to its California headquarters, Zymo Research has two international branches located in Freiburg, Germany and Beijing, China. The company's DNA and RNA extraction kits are used mainly by academic and biopharmaceutical scientists, who need to isolate and purify DNA/RNA from tissue, blood or serum samples. 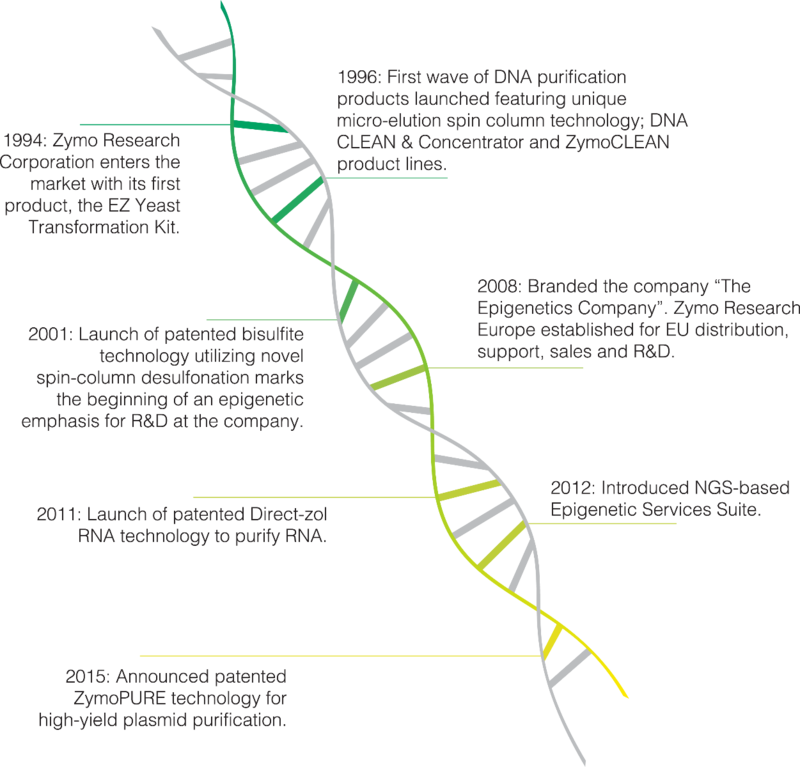 Zymo Research is also known for its epigenetics line of products used in DNA methylation detection and quantitation. They carved out a niche in this market by being an early adopter in the field of epigenetics and by offering a high-quality product. They are considered the leader in this market space. One of the keys to Zymo's success in the past 22 years has been their ability to listen to their customers and react quickly. Their tagline "The Beauty of Science is to Make Things Simple" is a mantra that is reflected in every one of their products. From epigenetics to RNA/DNA isolation, each product is designed to be both simple in use and robust in its performance. Shown below are a few facts about Zymo Research Corporation. Zymo Research Corporation has contributed greatly to the biomedical field, as evident by the numerous products launched in just two decades. Simplifying and speeding up the DNA/RNA isolation process has been the company's primary focus. In 2001 they entered into the burgeoning field of epigenetics and quickly became one of the leading players in this market.